Globally Herbal medicine market is expected to be $115 Billion by 2020. With the GAGR of 8% of Herbal medicines market, quick and reliable identification of herbal ingredients and their adulterants are most important factor in maintaining the quality of herbal medicine. 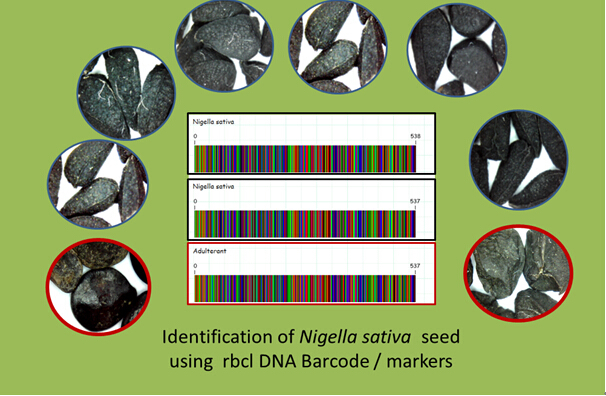 In recently a research paper by Lead author Sudhir SP has used the DNA Barcode/ marker like rbcl (ribulose 1, 5 bisphosphate carboxylase/oxygenase) DNA to identify various samples of Nigella sativa seed and its adulterant. This modern technic is quick and quite reliable in maintaining the quality of Nigella sativa seeds. Nigella sativa seed is considered as the seed of blessings in Islamic literate; it is proven to be having antimicrobial, antioxidant, anti-aging, hair growth promoter, sun protection, anti-cancer activity, cardiovascular activity, anti-inflammatory activity, immunomodulatory activity, antioxytocic activity and wound healing activity. Nigella sativa seed is mainly used in its raw seed form, and other popular forms are seed oil, seed paste, and different extracts. It is commonly known as Black Seed, Fennel Flower Black cumin, Love-in-a-mist., nutmeg flower, Roman coriander, a Barakah Shooneez, Habba Sauda, Habb al-barka, Krishana – Jiraka, Upakunchika , Kalonji and Onion seeds. Researchers extracted DNA from the seed coat of Nigella sativa and performed amplification of DNA using rbcl primer. DNA reads obtained were further sequenced and analyzed. MEGA7 software was used to analyze DNA reads regarding sequences quality, nucleotide composition, sequence differences and phylogenetic analysis. Further researchers compared the rbcl DNA sequences obtained from all 10 samples from different geographies with NCBI GenBank using BLAST tool. Out of 10 samples understudy 2 samples were found to be different in terms of genetic makeup , 8 samples were matched with Nigella sativa KU499880.1 accession already reported on GenBank, while samples with different rbcl DNA sequence were identified as Allium Cepa seed (matched with AB292286.1 Allium cepa chloroplast DNA, rbcL) and Clitoria guinensis Seed (matched with JQ591652.1 Clitoria guianensis voucher BioBot00900 rbcL gene, chloroplast). Identification of Nigella sativa seed and its adulterants were reported to be quite accurate when compared with results obtained from other traditional methods of plant material identification technics like morphological and physiochemical analysis of samples. This modern technique is seen to be quite promising, which would save analysis time, cost and increases accuracy over traditional methods of herb identification.